The debate about the U.S. Census in 2020 and the Trump administration’s oversight of it is overly focused on the political implications — it’s coming across like a football game, with one side on the offense while the other side scrambles to find a weak point. The census is not the NFL. It’s a requirement established in the Constitution, and a precious, quantitative-based method for knowing who lives in our country with significant implications for the way we do business. If we allow the census to be politicized and treat it like a political football, we could throw away the goodwill it has built for generations. Opponents armed with a big ad budget already are going after Thomas Brunell. He’s a professor at the University of Texas at Dallas who apparently will be appointed to serve as deputy director of the Census Bureau. He has set himself up for trouble by arguing that competitive elections aren’t ideal, which seems bizarre in a country with such close popular vote totals in presidential elections, and where the right to vote is established in both the federal constitution and by state law. Even before the Brunell news broke, The Atlantic reported that the Leadership Conference on Civil and Human Rights and other civil rights advocates were concerned that an online census option would result in undercounting. The administration’s effort to stop counting LGBT citizens was also met with opposition. To all sides, let me try to suggest some common ground: The census provides education policymakers and administrators with vital information, so getting it right is critically important. We also know that Americans have consistently agreed on one topic: 71 percent of parents give their own child’s public school an A or B grade, a result that has remained the same since pollsters began asking this question decades ago. This result shows us Americans value the work of their local schools. Thanks to the census, we also know that three years ago the population of children in U.S. public schools became majority non-white. Furthermore, the census models predict America’s foreign-born population will make up 20 percent of the U.S. population by 2060. To put that in context, the previous high was about 15 percent foreign-born more than a century ago, in 1910. The census helps us understand the ways that our population is changing. A major goal of education policymakers is striving for education equity. 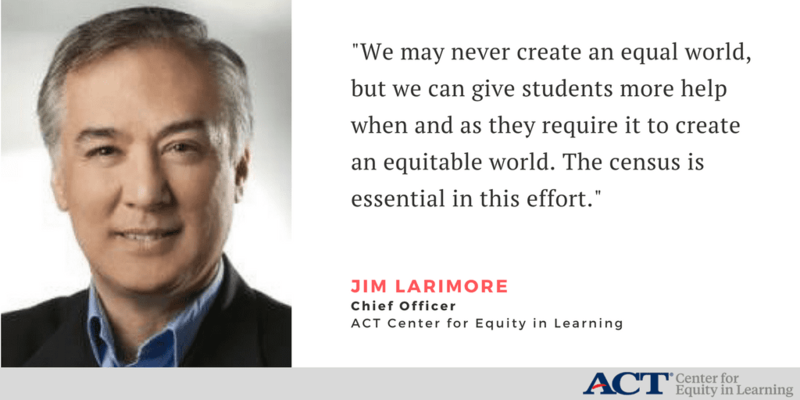 Note the word “equity,” which is different from “equality.” We may never create an equal world, but we can give students more help when they require it to create an equitable world. The census is essential in this effort; more accurate data reveal who is attending schools and universities, open the door for a better understanding of student needs, and aid in more narrowly focusing attention on supporting those needs. After all, it’s hard to argue with cold, hard numbers. The Racial Heterogeneity Project, organized by the Institute for Immigration, Globalization and Education at the University of California, Los Angeles, with support from the ACT Center for Equity in Learning, has been at the forefront of these education concerns regarding the census. The project shows that current data practices and policies don’t accurately reflect the nation’s diverse demographics and have led to the harmful oversight of many underserved groups, who are among the most in need of recognition and resources. Data should be collected in a manner that accurately reflects the heterogeneity of different racial populations. The new census racial category Middle Eastern or North African, for example, reflects the responsiveness of the government to capture the changing demography. Disaggregated data must be made more widely accessible, and effective models for reporting and using these data are needed. Results from studies using disaggregated data should also be shared widely to show the utility of these data for informing practice, policy, and advocacy, especially for subgroups that are particularly marginalized and vulnerable. Broad, bipartisan public concern about education, and the role the census plays in informing improvements in education, give us a way to increase the aperture in the debate. To do otherwise is to take the shortsighted view that all we need is an umbrella during a severe rainstorm, while ignoring that the water is rising around us, ruining crops and flooding streets. There’s still time to the improve the 2020 Census. Starting with an education focus that reflects the backgrounds and experiences of our country’s diverse population is a commonsense way forward.